Sometimes baking inspiration isn’t planned; rather it’s brought about by a life experience. One time while shopping in local gourmet shop I found myself in the bakery section contemplating things “oh so sweet”. 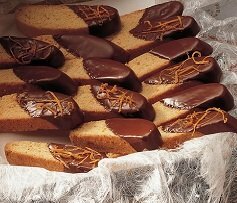 I picked up a small package of chocolate dipped biscotti and found them to be around $5. In the ensuing battle between my craving and rational thought, which told me I could make many more biscotti for the same price, I decide to create the ultimate chocolate delight, Triple Chocolate Biscotti. I did a quick review, in my mind, for the necessary ingredients and realized I had everything at home except the melting chocolate. I went to the chocolate department and bought what I needed for less than $5. In another bowl with an electric mixer beat together butter and granulated sugar until light and fluffy. Add eggs and beat until combined well. Stir in flour mixture to form stiff dough. 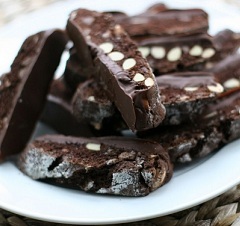 Stir in walnuts and chocolate chips. After mixing, scrape the dough out onto a lightly floured work surface and BRIEFLY knead it just until it comes together and the divide it in half. Shape half of dough at a time into a rectangle, 12 by 2 inches, sprinkle with confectioners' sugar and carefully transfer to prepared baking sheet. 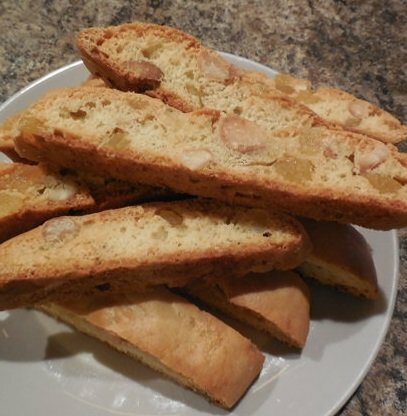 Cool biscotti on baking sheet for 10- 5 minutes. On a cutting board cut biscotti diagonally into 3/4-inch slices. 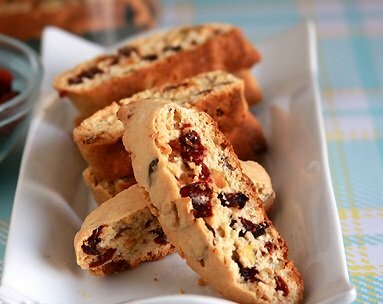 Arrange biscotti, cut sides down, on baking sheet and bake until crisp, about 10 minutes. Melt Chocolate for dipping. Dip one end of each cookie into melted chocolate and place on waxed paper until the chocolate is firm.